Street party fever engulfed the UK in 1919, eventually evolving into a British tradition associated with celebrating national occasions. WWI Peace Parties rejoiced at the liberation of Europe, as well as the signing of a formal peace treaty between the allied powers and the German state. Hundreds of neighbouring residents would gather for wild festivities, expressing relief that the prior four years of struggle were finally over. Held between the 29th and the 30th of June, Alnwick Castle hosts a wonderful peace party bursting with captivating entertainment – with something to be enjoyed by the whole family! Witness a fast paced and action-packed performance of Punch & Judy, filled with laughter and audience participation, by expert puppeteers. This entertaining comedy will have you in high kinks with their mischievous ways. Listen to the joyous tones of traditional peacetime melodies, performed by two incredibly talented Northumbrian instrumental groups: Ellington Colliery Band on the 29th June and the Alnwick Playhouse Band on the 30th June. Be thoroughly amused by our resident jester Peterkin’s unabashed tomfoolery, in his 1920s themed performance! Watch him wobble precariously on wooden stilts, experience close shaves with his fire-eating antics or balance upside down on any fool he can trick into lying on the floor! So why not bring down your picnic and come celebrate the peace time centenary with Alnwick Castle this summer? 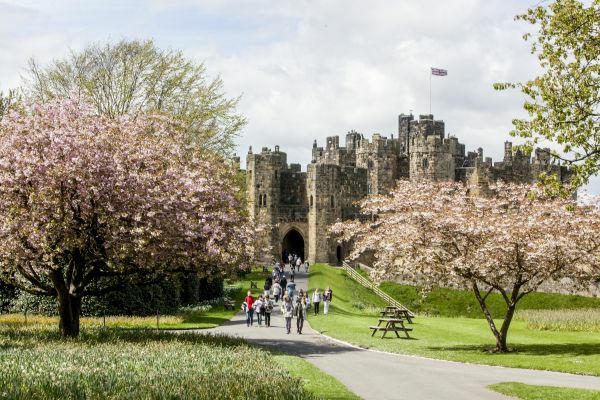 This incredible weekend extravaganza is free with admission to Alnwick Castle! Please check the ‘What’s On’ board upon arrival for timings and locations, as these can vary day to day.